Saxophonist Hugh Hunt is a Memorial University music student who's excited by the university's plan to create a dual music-business degree. 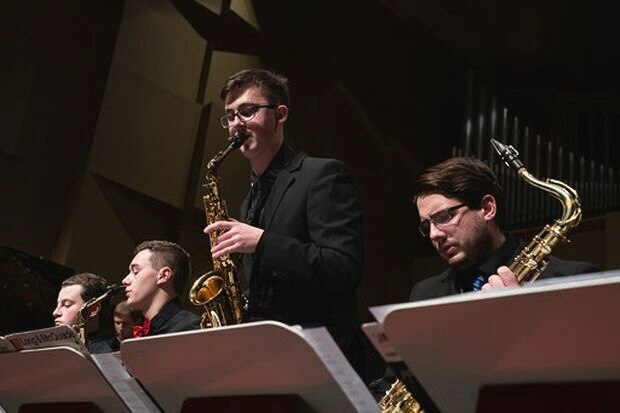 When saxophone player Hugh Hunt decided to study at Memorial University last fall, he could choose between undergraduate degree programs in business or music, but not both. “I was passionate about business and music and it was a really hard choice,” says the 18-year-old from Kingston, who has been playing his instrument for seven years. Ultimately, he chose music. But next year, pending imminent approval from the Newfoundland and Labrador university’s governing board, Mr. Hunt will have an opportunity to earn degrees in music and business over five years, at least two years faster than if he took each program separately. The new option, with a January deadline for applications, is of “high interest,” says Mr. Hunt, who plays classical and jazz saxophone and is mulling his career choices. Memorial is set to join a growing list of universities adding joint degree programs for students to earn credentials in more than one discipline at once and, potentially, expand their career options. At McGill University’s Schulich School of Music, for example, students interested in managing their professional careers can earn a minor in music entrepreneurship by taking courses at the university’s Desautels Faculty of Management. In 2013, the University of Western Ontario’s Ivey Business School and Don Wright Faculty of Music teamed up on a five-year “combined degree” program. After two years of study, eligible undergraduates from three of 17 music faculty programs can transfer to Ivey for two years of business, with the fifth and final year a blend of courses from both disciplines. Currently, five Western students are on track to graduate with degrees in music and business next year. While the proposed Memorial program integrates music and business courses from first year and Western students get their first taste of business school starting in second year, both universities share a similar philosophy of co-operation among faculties to expand the academic menu for students. “This joint degree with music gives us a blueprint to start and offer collaborations with other faculties,” says Isabelle Dostaler, dean of the faculty of business at St. John’s-based Memorial. She emphasizes that on-campus partnerships only work well when, as in this case, discipline-based faculties see value in working together. “You need deans at the table who wish to work together and remove [any] roadblocks,” she says. Shortly after her arrival at Memorial last year, she says she and music dean Ian Sutherland quickly identified opportunities for a “strategic partnership” between their faculties. “Ian and I are champions for more interdisciplinary programming at Memorial and higher education in general,” she says. Program collaborations between music and business are, perhaps, a not-so unsurprising fit. The music industry in Newfoundland and Labrador contributes $51.1-million to the provincial economy annually, according to a study earlier this year by music industry association MusicNL and accounting consultancy BDO Canada, which also estimated that sector-related job growth of 15.4 per cent since 2011 is more than double the national average of 6.2 per cent. “We are hoping this [joint degree] program will contribute to the overall professionalization of the music industry in Newfoundland and Labrador by creating more people in arts administration, business management, “says Mr. Sutherland, who also sees the potential to recruit students from non-music professional careers, including business, medicine and law. Before taking up his deanship at Memorial in 2016, Dr. Sutherland, a trained musician and Newfoundland native, served an associate dean of research and director of PhD studies at the IEDC-Bled school of management in Slovenia. There, as part of his academic duties, he provided consulting advice to companies in Europe on human resources and leadership issues. He says a number of his friends have expressed interest in adding a business degree to their credentials. Follow Jennifer Lewington on Twitter @JenLewington or contact her at jlewington@bell.net.